The Kenda Hellkat Pro Mountain Bike Tire offers superior traction combined with serious strength. Developed and tested by World Cup downhill UR Racing team riders, this tire is unapologetically gravity-oriented. 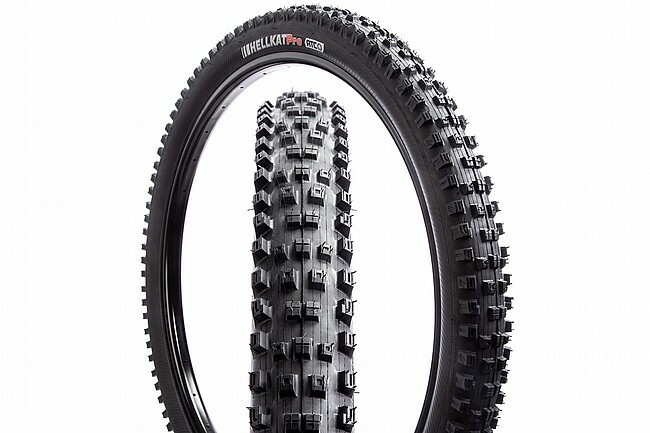 Featuring Kenda's Advanced Gravity Casing, the Hellkat delivers unrivaled puncture and slashing protection. An optimized tread design lets you rip across a wide range of conditions, never letting you down through sharp turns or aggressive braking. Durable, fast-rolling downhill tire developed and tested by World Cup UR Racing team riders. Tread pattern optimized for performance across a wide range of conditions. Advanced Gravity Casing features three pieces of KVS help prevent cuts and punctures. RSR evolution features new RSR dual layer compound for better control and long tread life.